PRODUCT: 2" DIAMETER SPIRAL / RIBBON MIXER WITH 16" LONG 3/8" HEX SHAFT. HEX SHAFT FITS 3/8" DRILLS. PRICE/EACH. Spiral Ribbon design ensures even mix of all kinds of materials without wipping air. Ideal for mixing paint, drywall mud, and EIFS adhesives and coatings. Use in 1 to 5 gallon pails. Works best at 500-900 rpm. EXCELLENT FOR USE IN MIXING SMALLER BUCKETS OF THICK COATING MATERIALS OR ROOF PAINT. Heavy Duty hexagonal shaft for positive chuck engagement. Welded steel construction with electrostatic painted finish. 4 in. 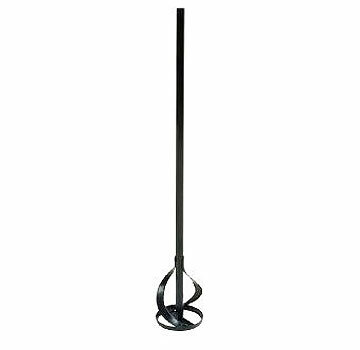 DIAMETER SPIRAL / RIBBON MIXER WITH 23-1/2 in. LONG SHAFT (FOR 5G BUCKETS). FITS 1/2 INCH DRILL. PRICE/EACH. 5-Quart Plastic Bucket with Metal Handle, Leaktite #500. Made with HDPE. 8-5/8 inch Diameter at top x 7-1/8 Deep. Color could be random, but is generally blue. Made in USA. Price/Each.